We (my will-be-then husband & our toddler) are going to Nepal in the autumn so I'm very big on Asia at the moment. Howsabout some hiking there? I went to Vancouver Island in British Columbia two years ago and still think it's one of the most awe inspiringly beautiful places I've been to. We stayed in a log cabin on a beach in Tofino which I can't say enough good things about. I don't think I've ever felt so relaxed in my life. The town was so peaceful, quaint and friendly and the scenery was second to none! Needless to say, I'd highly recommend it! I'll have to second the tip about Vancouver Island, I've never been, but I've heard it's amazing so many times that we're planning on going sometime soon. Or you could try Newfoundland, it's quite the ferry ride, but the mountains and landscape are fa-bu-lous. Vancouver's beautiful , and so is the rest of BC. I've been going every second summer for about 10 years, mostly on family camping trips. It's absolutely beautiful, and really really warm if you get down to the Osoyoos area. I would highly recommend it! I'm not sure if you've been to Belize, but I was in love with the idea of going to the Mayan Ruins and cave exploring/tubing (ATM looked freaking AWESOME! ), and also snorkeling. There is a place called "Ian Anderson's Cave Branch" lodge, and it is in the heart of the jungle, with open air cabins and limited electricity. It looked so amazing. It offers all-inclusives with (I believe) airport transfers, too. Patagonia would be awesome, but it'll be winter there in June, July and August... So it'll be great for skiing and snowshoeing but not so much for hiking. I'd put a vote in for Northern Italy. What happened to the Banff/Jasper National Parks idea? Alternatively the Lonely Planet puts out these ___# of trips in a given area books which have been really helpful in narrowing things down to the possible. You could see if they have one for BC. My vote is for Italy. I have a friend who lives in Southern Italy and owns a B&B with her husband. She recently started doing travel itineraries and she and her husband have connections all over Italy. If you want some inspiration or have questions you can check out her blog http://my-bellavita.com/. We're geeting married in April and planning to honeymoon this summer in Vancouver. Possibly do Vancouver for a few days and then take a train down to Seattle. Seems like a great place for a combo of outdoors and city life which is perfect for us. I live in chile, have traveled to the chilean patagonia, and am going there again in a few weeks. I took a look at the GAP tour for patagonia, and some of their information is incorrect - US nationals always have to pay a "reciprocity" fee upon arrival in both chile and argentina. In chile, it's about $120, in argentica, about $200. Also - $100 for food a day? seriously? I'm sure gap adventures are cool, but personally I'd be hesitant to book an excursion in south america. tons of south american teens & 20-somethings backpack around here (just like US-peeps for europe), and they do it super cheap. If you're interested in Patagonia, my husband and I did a kayak trip (one that I would recommend, but it is still expensive - I'd only book the kayaking part, not the lodging, etc through them). We went with "miralejos". Also, the Cochamo valley in the chilean part of patagonia looks like Yosemeite. there's a dude from reno who lives in the cochamo valley - he built a refuge (insanely nice 2 story wood house) for climbers, etc. for the area. Other than that, the absolute best time of the year to travel to patagonia is christmas. Later than mid february is pushing it, weather wise! I'm dying to get back to vancouver island, actually. there's supposed to be an insanely awesome trail that goes from the east side to the west - it lets out on the open ocean! + all the hiking trails I've seen thusfar in BC are ridiculously well taken care of. I vote for Kauai! I know Hawaii can be sort of cliche' but the north shore of Kauai is breath taking. My soon to be husband and I spent our first summer together in Kilaua (we're both teachers as well). We stayed in a glorified garden shack on a friends property. We spent every day at different beach surfing and reading. We hiked the Napali Coast (camp at mile 8 - the beach at the end is crowded) and lots of other trails. We ate the most amazing sushi I've ever had. It rained every day but we didn't even notice because it's such a warm, non-intrusive rain. I went to yoga at a great yoga studio in Hanalei. There's a great book called Kauai Trails by Wilderness Press that will show you all the hiking options. We found it to be totally not crowded or super touristy; although we do live near Lake Tahoe so we might be a little more tolerant than most. The people were very friendly. I just can't say enough great things about the 5 weeks we spent there. Wow, I feel so lucky to live on Vancouver Island after reading some of these comments! I still highly recommend BC, and if you need tips or ideas or just want to narrow down your list of things to see, I'd be happy to help! My recommendation would be to fly in and rent a car. See Vancouver, take a BC Ferry to Victoria, drive up the island to Tofino, drive up the island to Port Hardy to take a BC Ferry alllll the way up the coast to Prince Rupert and across to Haida Gwaii (Queen Charlotte Islands). Then back to Prince Rupert, drive down to southern BC and see the Okanagan Valley before driving back to Vancouver. It kind of does a circle around the province! I also say, don't give up on BC. Basically, you can't go wrong. You can fly into Vancouver, or Seattle or Spokane and drive. One of my favorite spots is called Point-No-Point resort; it's rustic cabins by the ocean. Very relaxing and beautiful. If you want to fly into Spokane and drive, Nelson is a wonderful place to hike and relax. It's a ski town in the winter, and so has a sort of hippie vibe (and plenty of vegetarian food!) Also, if you fly into Spokane, you're not far from Priest Lake -- which is one of the most amazing and unspoiled places in the US. It's definitely worth a side trip. BC (and the rest of the Pacific Northwest) is one of those places where you don't need a highly-evolved plan. You don't need to find the best hiking trail (because they will all be awesome) or the perfect place. You just need a base of operations and a whim, and you're good to go. We went to Kauai for our honeymoon last year. I wish we'd had more than a week to stay there. We're not really hikers, but we really enjoyed just driving around the island and spending time on the beach. 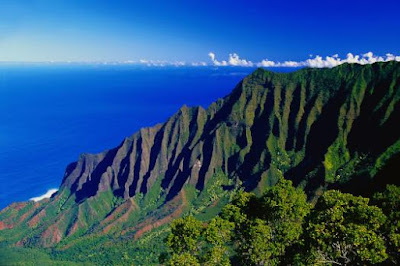 We stayed on the East coast so we'd have easy access to Waimea Canyon in the South and the Napali Coast in the North. The entire island is breathtaking! I feel like Hawai'i is often one of those places that I forget about because it doesn't seem as exotic as other foreign countries. My sweetie and I opted for Costa Rica for our honeymoon over he same trip you just described. I think it would be fabulous either way... (Although Vancouver Island is incredible too) It sounds like you still have Hawai'i on the brain though... I think you will enjoy anything you choose...and all those other options will always be there for later too... good luck! Can I just add that I love that you go on an annual adventure! I think we will have to plan and budget for that too! come to bc! it's really not all that daunting although there are a lot of beautiful places. i'd recommend coming to vancouver island (i'm just a bit biased since it's my hometown) going to tofino and hiking the west coast trail. all the places sound nice though, you can't really go wrong! @jarsandbells: Do you mind if I ask where y'all went in Costa Rica and did you enjoy it? My fiance and I just booked a hotel in Manuel Antonio for our honeymoon week in May. We're super excited! For our honeymoon we took the ferry up to Vancouver Island, then another ferry to a smaller island called Lasqueti. We stayed at a "bed & breakfast" where we got an entire cottage to ourselves and the "breakfast" was a supply of tea and homemade croissants in the freezer! The whole island is off the grid, so was right up our enviro-travel alley, and made for some great adventuring (and so much freedom & relaxation!!). The B&B had a rowboat, and oystering / clamming supplies, and two beater bicycles for exploring the island. I can't recommend it enough - the B&B was "The Old Bakery" on Lasqueti. You should be able to find it on Google. Another, wildly different adventure that I also 100% recommend is Cambodia! The temples around Siem Reap and Angkor Wat are INCREDIBLE and all adventuring types should go before it gets too commercial and Disney-fied. these are all awesome ideas! i want to take a trip to BC now. one of my favorite trips was to jamaica! we flew into kingston, rented a car, and drove through the interior to ocho rios (very interesting, you see the local culture and landscape), then down the coastline to montego bay. we returned the car in montego bay and took a shuttle to negril and stayed at the "yoga resort" for less than $50/night! the yoga resort is not really a resort, it's basically little wooden cabins with a hammock on the balcony, outdoor showers, and yoga in the mornings... you guys would LOVE it! Hawaii is amazing. It's so much more than mai tais and the hula. The sense of calm you feel within hours of arriving is something I've dreamed about ever since I vacationed there last May. For a true getaway surrounded by gorgeous mountains and the prettiest ocean imaginable, I can't imagine a better vacation spot. I am also in the BC fan club. It may be a little more expensive after the winter games, but still beautiful with wonderful things to see. Flying into Seattle and driving is one idea, you could also take the ferry from Seattle, which is another beautiful way to travel and see the sights on the coast. You won't run out of beautiful places to hike and the Canadians you run into on the way will be like-minded hospitable friendly folk. Especially because you have a green thumb. New Zealand! But only because I live there! Mongolia. I've been there twice and last time I joined a sustainable tourism tour and it was only me and my friend staying with nomadic family. There's nothing like being out in the desert truly alone and living out there for a week straight. Of course BC is beautiful too and I'm not just saying that because I'm actually from Vancouver. You can consider going to some of the smaller islands like the Gulf Islands or even up north more. Okanagan valley, Whistler, Squamish is not that far a drive away either. If you're into hiking, lots of great hikes in the Squamish area like Joffre Lakes or the Chief or you can think about doing parts of the Juan de Fuca which goes along the coast. Have you considered a home swap? We are planning to travel to Europe this summer and are looking to exchange homes, cars, etc. with another couple/family to allow us to have a longer trip and keep it affordable. We use HomeLink at homelink-usa.org. Patagonia would be amazing. I'm not sure if you're looking into Argentina or Chile, but I absolutely loved Argentina, and if you get the chance you could skip over to Iguazu Falls. Check out the pictures on google. It looks amazing. We're going to Argentina for 6 months after we get married, and we're taking a honeymoon weekend up to Iguazu. I can't wait! I vote for Kauai. My (new!) fiance and I just got back from there on Sunday- we just went for vacation, but then he proposed there also. :) The Na Pali Coast trail is ABSOLUTELY AMAZING and like nothing else. All of Kauai is really incredible, but the Kalalau Trail is really something special. We only got to hike the first 2 miles of it (we weren't prepared with backpacking gear) but it was the best thing we did. Even just doing that first bit (and we hiked up the first valley to a waterfall) really felt like an accomplishment while being in one of the most beautiful places on earth. If you do go to Kauai, I highly recommend getting "The Ultimate Kauai Guidebook" it really has a lot of insider information and is not at all about getting you to buy specific packages from their sponsors. It really helped us decide on places to go and things to do while we were there. have fun no matter what you do though! I lived there for two years, and recently moved to New York to be closer to family. The island is amazing -- scenery you won't see anywhere else. Plus, the Hawaiian culture is fascinating. Until I went there, I thought it was just beautiful beaches. But it's so much more than that. I've never been somewhere that feels so alive and close to nature. You take a hike and come across mangos, avocados and guavas. In the water there are endangered monk seals, sea turtles, migrating whales and rainbow-colored fish. Also, I love your blog. I had been searching for all sorts of alternative, non-traditional wedding sites to give me ideas for mine this summer. But everything I saw was still a massive, expensive event with all the trimmings -- just quirkier. I feel really good to know there are other people out there who just want a great party that celebrates friends and family! I wouldn't recommend booking a trip with a company like the one you mention. I know they are promoting sustainable and responsible tourism, but still the money you spend goes to the company, not to the people who are used as props for your "authentic" experience. $1300 for 10 days in Borneo is absolutely insane. You can find nice accommodation and food in Borneo for $5-10 a day. I recommend for you to be actually adventurous and make your own way there and around.